Samsung Health provides SDKs to help application developers and healthcare providers thrive in an open environment that connects partner apps, devices, and services. Samsung Health’s partners can provide their users with a richer set of health services and seamless user experience using the SDKs. Samsung Health is an engaging app for fitness, wellness, and care that runs not only on Samsung devices, but also on other Android and iOS devices. It helps users track their activity data and gain insights based on their own data. Samsung Health and its partner apps can share user data using Samsung Health SDKs with the user’s explicit consent. To find out more about Samsung Health app, please visit Samsung Health Website. For general inquiries and suggestions for Samsung Health, please use Samsung Health > Contact us. For Samsung Health partners, please contact dev.shealth@samsung.com for questions regarding the use of Samsung Health SDKs. Samsung Health Android SDK is available to qualified Android health app providers. It runs with installed Samsung Health on Android smart phones. Samsung Health helps users track their activity data, and using the SDK, partner apps can read Samsung Health data or write new data to Samsung Health. In addition, posting your app’s tracker tile to Samsung Health enables your users to access it directly and provides more seamless service experience between Samsung Health and your app. Generic Attributes (GATT) profile is general specification to connect BLE devices. Samsung Health Device SDK follows BLE standard specs and defines BLE compatible guidelines with enhanced specifications. The SDK provides a test environment for connecting your BLE compatible health devices and Samsung Health. Users can find approved partner devices using the Samsung Health’s Accessories menu. 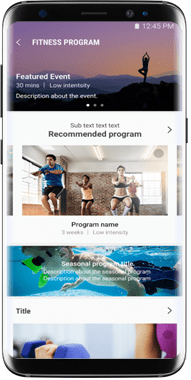 Samsung Health provides access to fitness programs created by industry professionals and a platform to share contents with millions of users around the world. We welcome all fitness professionals and content providers to join and publish their training and fitness contents using Samsung Health. For more information, please contact us . Please send your feedback regarding Samsung Health SDK to dev.shealth@samsung.com and email any business-related inquiries to biz.shealth@samsung.com. Samsung Health Server SDK is only available to strategic partners (with strategic partnership agreements). Please contact biz.shealth@samsung.com if you would like to discuss a strategic partnership with Samsung Health.